Otis Burt "Sonny" Shroyer, Jr. is an American actor who has appeared in various television and movie roles. 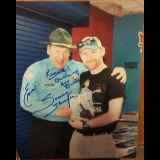 He is best known for his role as Deputy Sheriff Enos Strate in the television series The Dukes of Hazzard. He also starred in a spin-off called Enos based on his Dukes of Hazzard character. Shroyer is married and has two sons, Chris and Mark. Shroyer was born in the town of Valdosta, Georgia. He attended Florida State University on a football scholarship, but his career was cut short by an injury. He finished his degree at the University of Georgia. He began a career as a professional model in 1961. His first screen role came in the 1972 film Payday. Shroyer almost became typecast as a bad guy before landing the role of the naive Deputy Enos Strate in the hit pop culture series The Dukes of Hazzard in 1978. The Dukes of Hazzard role was Shroyer's most visible. His character was written out at the start of the third season to be given a spinoff series titled Enos in 1980. The new show was not a success and was canceled after eighteen episodes. Shroyer returned to The Dukes of Hazzard at the start of the fifth season in 1982 and remained with the series until it ended in 1985. New Response (OLD!) (Success): Met Sonny.. such a great guy and was so happy to t..